University of Utah engineers will study better semiconductor material for high-voltage electronics. Inside power systems, converters and electronic switches convert and control electrical energy from one form to another (such as AC to DC or DC to AC). This loss in energy is so significant, each year more power is lost in these conversions than what is generated from renewable energy sources in the U.S. But what if you could make a much more efficient power converter and minimize the losses? Scarpulla, U electrical and computer engineering assistant professors Sriram Krishnamoorthy and Berardi Sensale-Rodriguez, and Washington State University materials science and engineering professor Kelvin Lynn have received a $1.88 million grant from the Air Force Office of Scientific Research to study the fundamental properties of a semiconductor material known as gallium oxide, which could be used in high-voltage power systems for anything from cars to airplanes and ships. This research could lead to improvements in surveillance drones, for example, by allowing them to fly longer and faster. It also could speed up the development of all-electric airplanes that run on solar power or improve the performance and range of all-electric cars, buses and trains. A semiconductor is a material that conducts a current in an electrical circuit. Silicon, for example, is the semiconductor most used in computer processors. 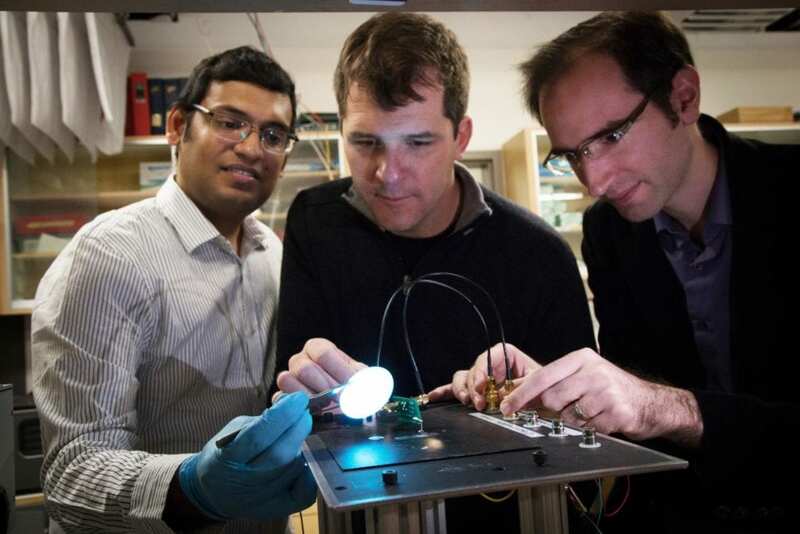 But these engineers believe gallium oxide could prove to be a better semiconductor because it is one that can work with high voltages of electricity without producing excessive heat or burning up. Every material breaks down at a particular electric field, referred to as “critical breakdown field,” and this critical field is expected to be much higher in gallium oxide compared to other semiconductors such as gallium nitride and silicon carbide. Another advantage is that gallium oxide is a crystalline material that can be grown in larger quantities. “You can produce more of it, and you can produce it better,” says Sensale-Rodriguez.